The following is a guest post by Karl from WiseStockBuyer.com, a blog that teaches you how to how to buy stocks and grow your nest egg. As you will undoubtedly be aware, the markets have been very volatile lately. There are two ways to look at this, you can be fearful or you can take advantage of the opportunities that arise. Personally, I love volatility, when the market is in “panic mode”, it moves on peoples emotions rather than logical economic fundamentals. This usually creates some fantastic bargains. There are many relatively low-risk stocks at present that offer fantastic dividends yields, many well in excess of 3%. This is alone is much higher than treasuries and money market funds. If you are new to trading stock market shares, there is a lot of free useful advice available online such as blogs like WiseStockBuyer. Or you can use investment brokers like Betterment to simplify the investing process and still get great returns. If we look back through history, the stock market has shown it always beats cash in the long term and more importantly it always beats inflation. For me at least, one of the biggest attractions of the stock market is the long term growth potential. The power of compounding your returns and your dividends can create considerable wealth over the long term. By using reliable stock charting software, a long term investment can be much easier to plan, thus making the rate of return much higher. If you were aiming for a relatively modest 8% per year from your stock investments, This would turn $50,000 into $233,047 in 20 years. Investing in stocks can also diversify your portfolio, which is a very good thing. With stock investing you can select your risk tolerance. If you want to keep risk low, you can invest in established companies with excellent track records such as Walmart (WMT) and Exxon Mobil (XOM). If on the other hand you prefer to take on more risk, with the goal of higher returns you can consider investing in riskier growth companies such as Facebook(FB) and Google (GOOG). With the yields on 10 year notes making record lows at the moment, treasuries are not very attractive. Most of the other negligible risk assets are also yielding exceptionally low returns. In real terms, with inflation factored in, these are losing value. The problems in the eurozone seem to have been dragging on for what feels like forever. There is a big question mark hanging over these issues. Some of the current unknowns are, Will Greece leave the Euro? Will the Euro even survive? These uncertainties are causing investors to be fearful and avoid investing in stocks. There is of course the risk of another banking crisis and credit crunch similar to the one we saw in 2008-09. If this was to occur there is a big chance of another global recession and a big crash in the market. This said, stock markets have had corrections and crashes since they began, they are nothing new. If there isn’t a banking crisis, there will be some other reason causing the market to crash. The market has always recovered from these crashes and whilst unsettling, they are a part of investing. Investing in the stock market will never be risk free. You will no doubt have heard it before..”the value of your investment can go down as well as up”. This is very true. Make no mistake, stock trading is a business and must be treated as such. Business involves risk, but if you are prudent and do your homework, you have a much better chance of coming out on top. 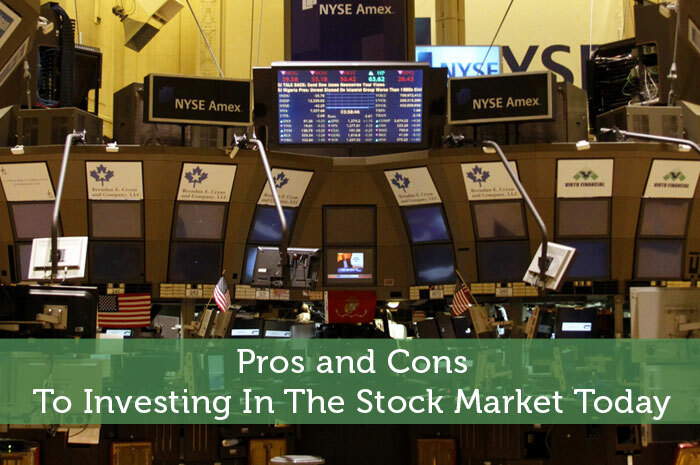 I have laid out what I feel are the most common pros and cons to investing in the markets right now, but only you can make the decision if this path is suitable for you. What are your thoughts on investing in the stock market these days? Is there a particular problem holding you back from investing in stocks right now? I think everything in life comes with risk and one has to weigh the risks with the benefits individually. What is right for one person may not be right for another. I think when it comes to investing there are more conservative options that come with lesser risk than others. These are good ones to focus on. I also think diversifying is key- the more spread out you are the less you affected if one component changes. Yep, I totally agree. Diversification is the way to go. I prefer to keep risks down too. Slow and steady wins the race. When you’re a long-term investor, it all comes down to whether you have the courage to zig when others are zagging. Ignore the daily ups and downs of the stock market if you want to keep your sanity. I couldn’t have put it better.. You need to get in when everyone is panicing, which is not easy! I don’t play with the stocks since I invest in target retirement funds. I like playing around on weseed.com though just to imagine what it’d be like to invest in companies I would want to invest in. I think the global equities system needs a major shakeup, and I don’t want to be on the dog’s back when he shakes us all off. I just have this nagging feeling of another Lehman Bros. event. Next year maybe…or maybe never. I’ve been wondering this too…Especially with the eurozone “blowing up” every 5 minutes. No, the stock market will never be risk-free, but there are ways to be smart about it. Definitely do your homework! While I’m adding to my IRA right now, I’m just sitting on the money for now. I’m not seeing volitity right now. I just see downward motion. Like Miss T said, nothing in life is guaranteed, and everything has its pros and cons. Even though the market is very volatile right now, there are many stocks selling for well below their value, and as history always repeats its self, what goes down will come back up. The wise investors love opportunities like this, they hold, and buy….while everyone else is selling. Absolutely. Personally I like to buy stocks when everything is crashing, as it presents some of the best opportunities. Though it takes guts to do it in very volatile conditions! You are very right, it takes a lot of balls to buy stocks in volatile conditions! A lot of it depends on your retirement horizon. I know I have close to 40 years, so I’m fine with investing heavily in stock funds and riding the waves. For those in or near retirement I think it becomes a lot trickier. Yep..I totally agree Justin. If you are younger, you can afford to take more risk to give you the chance of retiring early, sensible risk of course.. If you are already near retirement age, taking on too much risk with your nestegg may be unwise. Wiseman! The short term at the moment is very risky, so many uncertainties in the air. Long term usually works out well. As you say, investing in the stock market is always going to be a gamble. You definitely need to do your homework before you invest in any stock. I only ever invest in things I understand. If you don’t understand the company/product/service you should steer clear. Mike I couldn’t agree more. Stick to what you know. Warren Buffet also says this a lot too. Even with the volatility I am still playing the stock market, although I admit not as much. This is more my fault though because I’ve still haven’t been able to master a proper stop loss technique. Had I done so on my last transaction I would have been able to take real advantage of the current volatile market. One strategy for stops is to use put the just below major support levels. For me it just so happens that I only became old enough to have a brokerage account when the stock markets are pretty bad. I consider it lucky for me however. One for experience to go through tough times before times of prosperity. Second the bargains I can get. It is possible that I will be cursing being so excited about stocks right now when I look back in twenty years but I think it will be a blessing to have low prices on stocks when I am starting out. Yes it is actually not bad timing to get a bit of an understanding of some of the potential lows. At least it wasn’t a few years before. And yeah there are plenty of good deals out there if you are not worried about the risk. When you are young you can usually take a lot more risk since you have plenty of time to ride out those bad times and be around when it all rebounds. Similar to what some other people have said, I think the best way to trade is just to put yourself in a little bubble…leave your emotions and others opinions outside and trade what you know and what you trust. Leaving emotions out of it can be quite tough. Some people are much more tempted to invest in something that they really love rather than something that they know will make good money. And then there are the people who will overreact when things go bad and sell at a loss rather than waiting for prices to go back up. It is fine to look at other people’s tips & hunches, but you have to be willing to do additional research yourself. You need to make sure it is actually a worthwhile investment and that the person making the tip didn’t have something extra to gain by sharing that specific advice.